N.B. 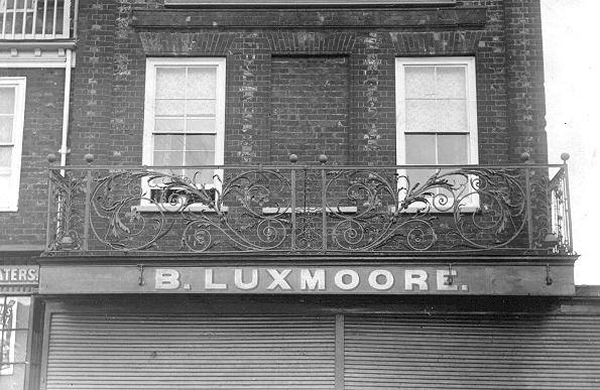 This building was demolished in 1947 to widen the entrance into High Street. 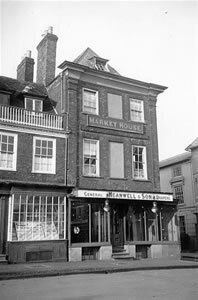 It was sometimes known misleadingly as "the Wren House" or "the Market House". ELIGIBLE BUSINESS PREMISES, CONSISTING of a roomy DWELLING-HOUSE, situate in the most Business Part of the Improving Town of Winslow, with a Double Frontage to the Market Square and the High Street, commanding a good Tenant at a High Rent, recently occupied by the late Miss Sarah Mayne, deceased. TO BE SOLD BY AUCTION, BY Mr. James King, AT THE GEORGE 1NN, WINSLOW, On FRIDAY, the 14th Day of JANUARY, 1853, AT 5 O'CLOCK IN THE AFTERNOON, Subject to such Conditions as will then be produced. All that substantial brick-built and tiled Dwelling-House, situate at the corner of the Market Square and the High Street, in the most central situation for business in Winslow, comprising, in the basement, a large kitchen, scullery, with pump and well of excellent water, and roomy, arched cellars, extending under the whole of the house and for a considerable distance under the Market Square, being dry and well suited for store-rooms; on the ground floor, a large room in the front, fitting for a shop for any description of business, a parlour at the back, and a wood-barn, with back entrance; on the first floor, a pleasant drawing-room, with a balcony, protected by a very handsome wrought iron railing, and a lofty bedroom at the back; on the second floor, two large and lofty bed-rooms; and on the third floor, three roomy attics, one of which contains a large lead tank for rain-water, communicating with the basement story by a lead pipe and tap; on the top of the house, with entrance from the attics, is a large drying-ground, protected by a parapet, commanding a beautiful and extensive prospect over the surrounding country for several miles. To a person wishing to enter into any kind of business, in the populous and thriving Town of Winslow, these Premises present an opportunity rarely to be met with; or, as an investment, they will ensure a high , rate of interest. The Property is Copyhold of the Manor of Winslow, being nearly equal in value to Freehold. The only outgoings are a Quit-rent of 3d. and a Land-tax of 9s. 1½ d. per annum. The House may be viewed on application to Mr. Grant King, draper, Winslow; and further particulars obtained from David Thomas Willis, Esq., solicitor, or at the Auctioneer's Offices, Market Square, Winslow. October: First dividend of 5s in the pound was declared by Mr Collinson of 99, Cheapside, London. It seems strange that when people are clamouring for "roofs to be put on" one has been taken off the Market House at Winslow. This action recalls parochial meetings and much discussion and many contend that the building should not be demolished on account of its Christopher Wren attribution, also because of the part that it played in making the general picturesque effect of the Winslow Market Square. During the war it has served many useful purposes. It was a much-valued Evacuees Club and has been headquarters of the W.V.S. During this period it was visited by Royalty and by the present Prime Minister (then Deputy)!